Never work with children or animals tells of John’s early career as a child actor, when he appeared in various stage and radio productions, as well as playing parts in several dramas on BBC Television such as The Four Just Men and The Quatermass Experiment. It goes on to tell of adventures working with a host of entertainment stars of the 1960s, 70s and 80s as a producer/director, including Jimmy Edwards, Marti Caine, Billy Fury, Bob Monkhouse, Peter Goodwright, Dusty Springfield, Danny La Rue, Patricia Hayes, June Brown, Sacha Distel, Chris de Burgh, Lesley Garrett, The Beatles and Mark Knopfler. The later chapters tell how, with the help of a legion of household names from the entertainment industry, John set up the Michael Elliott Trust as a charity dedicated to rescuing abused donkeys and providing a sanctuary for them. 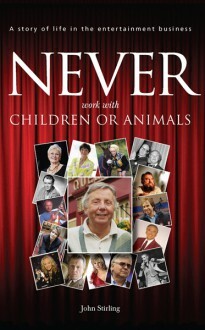 The book features a foreword by June Brown and a personal message from his lifelong friend Dame Judi Dench.